* Prices are subject to change without notice. Discounts are based on regular prices. These specials cannot be combined with any other offer, certificate or discount. You must mention July 2018 Special in order to receive special pricing and prices are valid after 8pm and only valid during July*. Blackout dates apply and include National Holidays and/or peak dates, call for more information. Travel charges for travel outside the local Boston area will be added to the prices above. We are not responsible to typographical errors or mis-quotations. Expo Limousine / Rollo Limousine Services Inc. is not responsible for providing specific vehicles. We will make every effort to accommodate a requested vehicle, but free upgrade vehicles are not guaranteed. Bookings are based on a "first-come, first serve" basis. Expo Limousine / Rollo Limousine Services, Inc. reserves the right the exchange / upgrade any vehicle at any time, for any circumstance. Overtime is subject to availability and if not pre-reserved is subject to our regular rates for the vehicle you choose. 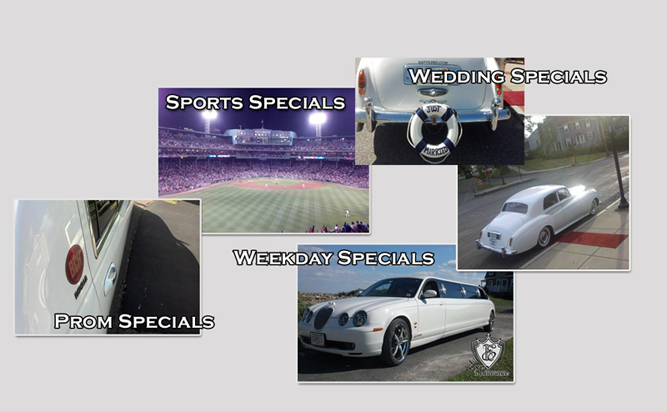 **These Specials are NOT valid on the Mercedes-Benz GL Limousine.